ATC-3000 to serwer portów szeregowych 3 w 1 (RS-232/422/485). ATC-3000 jest zaprojektowane do połączenia urządzeń RS-232/422/485 do sieci Ethernet. 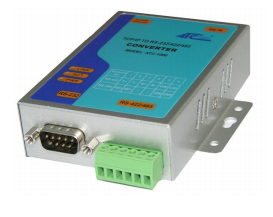 3-in-1 RS-232/422/485 interface Max.115.2Kbps Serial interface and 10/100 Mbps Ethernet. Supports 4- and 2-wire RS485 with AUTO-SEND™ and built-in terminator. Support TCP client, UDP for Virtual COM mode. Monitor, manage and control industrial field devices remotely. Configuration: Web Server page, Telnet Console. Monitor IP configuration utility for Windows.